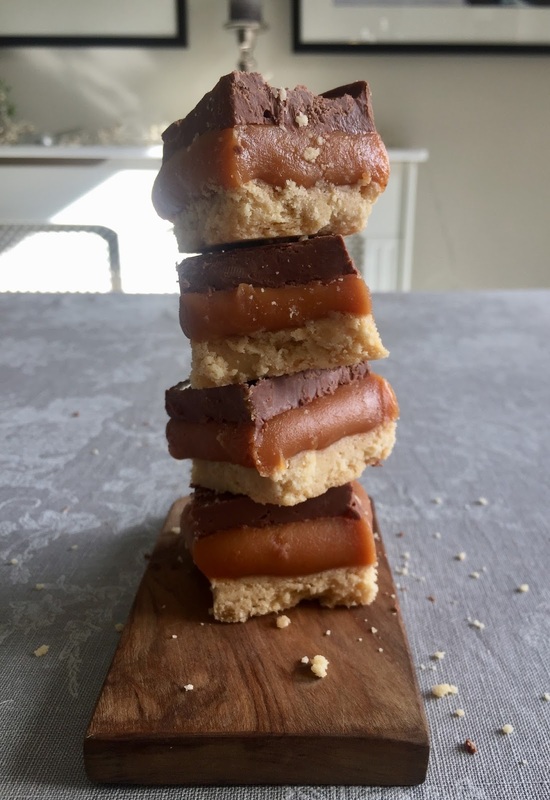 Ross had wanted to make Millionaire Squares for ages, one of his favourite things to order as a sweet treat, but our first attempt over a mid-term break was a baking fail. I tried to cut corners by using ready-made caramel from a tin and the end result was a giant mess. It did taste good though! This recipe is 'take two', and with the help of Rachel Allen and Donal Skehan I finally got it right. 1. First the shortbread base - a recipe from 'Rachel's Favourite Food for Friends' by Rachel Allen. I make these biscuits all the time and usually double the recipe as they don't last very long! They really do taste like proper Scottish shortbread. In a bowl mix the flours and rub in the soft butter, once it starts to form a crumbly dough add the sugar and kneed until combined. Roll the dough into a 22cm x 22cm greased baking tin and bake for 50 minutes. 2. Next the salted caramel - from Donal Skehan's website www.donalskehan.com. Place all the ingredients in a saucepan. Mix over a medium heat until all the ingredients have melted together, then turn up the heat and bring to a boil, lower the temperature and simmer for 10 - 15 minutes until the caramel turns from a custardy yellow colour to a golden brown. The caramel gets molten hot so this is an adult only job. A silicone spatula is good to use here as it gets right into the edges of the pot, and don't forget to stir often so it doesn't burn! Pour the mixture over the cooked shortbread and allow to cool completely. This can take a couple of hours so patient kids needed. Because the words patient and kids don't tend to go in the same sentence I realised that although Ross LOVES these and really wanted to bake them it wasn't an ideal school holiday recipe for under 6's. Oh well, live and learn! 3. 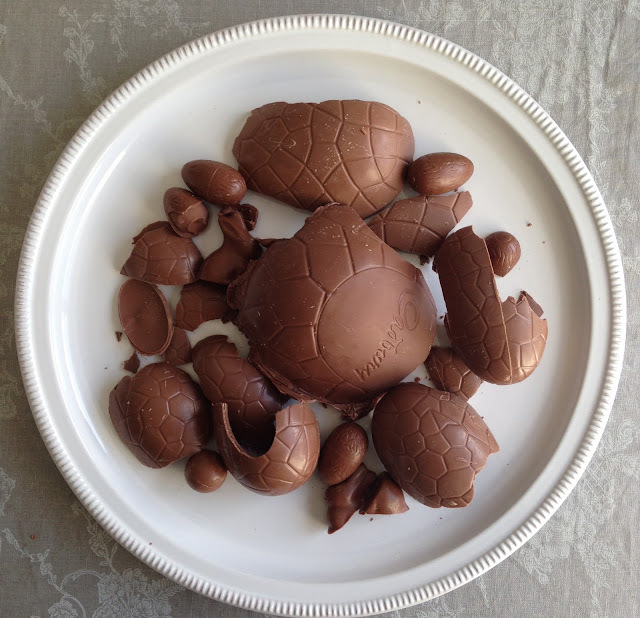 And the final stage, the chocolate - Our leftover Easter eggs. A foolproof, quick, super easy way to melt chocolate. Break up the chocolate and place in a microwave-proof bowl. Heat on full power for 30 seconds. Take out and mix. The chocolate will still be solid. Put back in the microwave for one minute, mixing again halfway through at 30 seconds. If there are still some small pieces of chocolate chunks in the bowl let the melted chocolate sit for a minute or two and mix again. If you need to, pop back in the microwave for a further 20 seconds. Pour on top of the cooled caramel and spread with a palate knife. Pop in the fridge until the chocolate is set then slice into squares. Although this wasn't an ideal kiddie baking day recipe by the time we tucked in we all agreed they were worth all that waiting! The salted caramel together with the buttery shortbread, topped with chocolate is such a decadent treat! If you want to be more virtuous when using leftover chocolate eggs and incorporate fruit, here's our 'Chocolate Apple Slices' recipe from a few years ago.